Our passion is the perfect print. Making sports teams look good since 1983. Team Print specializes in the decoration of athletic uniforms and apparel for collegiate, high school and middle school sports teams and clubs. We also decorate for businesses and ASI companies. With over 33 years in the sports decoration business Team Print has the experience and vision to create the perfect look for your team or organization. From simple to state of the art. Quality, speed, and flexibility are essential when it comes to the perfect print at Team Print. Big or small you can have the confidence that your order is done right. We have a 28,000 SF facility. 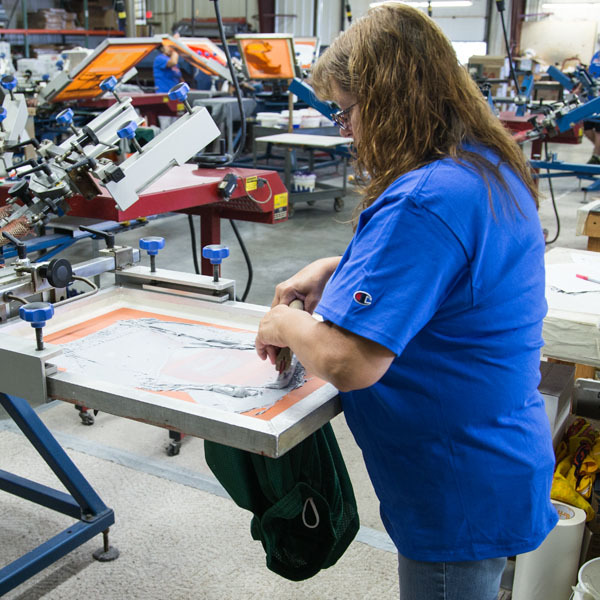 We have an experienced art department, modern twill cutting room with a skilled staff; 40-head embroidery department, and a 12,000 SF printing floor staffed with professional screen printers and equipped with top-of-the-line industrial machines. Complete flexibility. We can hand-sew your baseball jersey, screen print any kind of garments, and quickly handle any size embroidery job you might have. We have a huge selection. Including popular brands like Nike, Adidas, Under Armour and Rawlings. Custom screen printing, custom embroidery, tackle twill, and applique decorations for: split front baseball jerseys, football jerseys, soccer uniforms, basketball uniforms, lacrosse uniforms, cheer tops, sweatshirts, hoodies, polo shirts, bags, backpacks, caps, pants and any type of garments you may need. Feel free contact us by phone or email for more information about our services. We’ll be happy to answer any questions or provide information about pricing, turn-around times, or any questions you might have. Screen printing is mostly used for t-shirts, sweatshirts, and athletic jerseys, but we can screen print on nearly anything! Embroidery gives fabrics a distinguished upscale look and is most often used on polos, jackets, and hats. Heat press is a budget friendly way of making highly personalized affordable apparel. Tackle Twill Sewing is used by pro athletic clubs because of its stylish look and strong wear and tear. We help you create the perfect artwork too. Match your team’s existing lettering perfectly. We can even create your own custom uniforms. Why should you do business with Team Print? Quality work, competitive prices, On-time delivery. Peace of mind. Once you’ve submitted your order to Team Print you can sit back and relax. Even before your order enters production, we’ll contact you to resolve any questions you may have with your project. Quality customer service and getting the job done right the first time is how we win for your team.